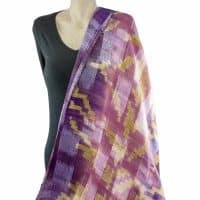 We have a lovely selection of authentic Thai raw silk scarves. Feel the warmth and softness of very light weight fabric on your skin and you will be surprised at how luscious it feels. You may be looking for a special gift idea and a silk scarf is a luxurious and elegant gift. 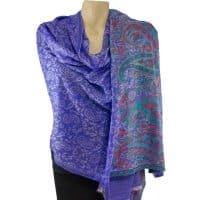 A Pashmina scarf or wrap drapes beautifully across your shoulders and has a soft, warm and oh so light touch. For the ultimate in luxury and warmth wrap yourself in one of our exclusive pure pashmina shawls, wraps or scarves. Our Pashmina scarves and shawls are perfect for weekend wear, work wear, cool days ,evening wear and travel. With proper care pashmina will last a life time. The most popular pashmina fabric is a 70% pashmina/30% silk blend. The 70/30 is tightly woven, The addition of silk brings a nice sheen to the pashmina shawl, wrap, or scarf.